Growth Habit: Gorse is a prickly, perennial, evergreen shrub which if left undisturbed will in favourable conditions grow to a height and diameter of 2-3 metres in four to five years. Type of Plant: Evergreen, woody shrub. Flowers: Bright yellow pea flowers can be produced all year but are more prolific in late winter to spring and in autumn. Fruit/Seed: Hairy black pods each produce 2 to 6 seeds which are green to brown in colour. Seed remains viable in the soil for over twenty years. Dispersal: When seed pods burst, seed can be thrown up to 6 metres from the parent plant. Seed is also spread by ants and water. Seed can be carried into new areas in soil attached to machinery and boots. Gorse regenerates prolifically after fire from soil stored seed. 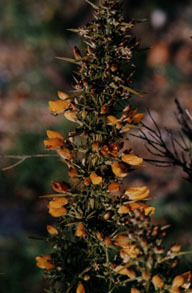 Distribution: Gorse is present in most agricultural and urban areas throughout Tasmania. If allowed to grow and spread unchecked, the weed can quickly smother large areas making them totally inaccessible. Gorse can colonise poorer soils. In Tasmania it covers large areas of hilly and stony ground where control is difficult and expensive. On fertile soils Gorse can occupy land that could be more productive in good pasture. Near buildings and on fence lines it constitutes a serious fire hazard during the summer months. It can also harbour rabbits and other vermin. On the other hand, Gorse can provide emergency feed and stock shelter. It is thought to provide a safe refuge for vulnerable native animals (such as bandicoots) from feral and domestic cats in urban areas where there is little native understory left. Status: Gorse is a Declared Secondary Weed. Gorse is a serious environmental weed. Once established, it competes strongly with native vegetation, alters fire regimes and reduces biodiversity. Mature plants will shoot from damaged or burnt stems and roots. Gorse is spread only by seed. Good hygiene is essential if gorse free areas are to be protected. Once established in an area, Gorse is difficult to eradicate due to the long term viability of soil stored seed. Similar Plants: Some native plants are also prickly in nature but they do not have the pea shaped flowers. For further information on Gorse contact the Department of Primary Industry, Water and Environment, Tasmania (Service Sheet, 72/95, Agdex 647). Grazing (Mar – Apr & Aug – Nov). Most important periods for grazing are April to July and September to November when gorse is in flower. Grazing will reduce flowering and seeding. The use of goats on burnt gorse has controlled infestations. Cultivation (Jan – Apr & Aug – Nov). A late summer early autumn cultivation will increase seedling germination of gorse. This cultivation is then followed by a later cultivation to kill the germinated seedlings. Chaining (May – Aug). The use of chaining requires reasonably moist soils in order to extract as much of the gorse root system as possible. Burning (Jan – Apr & Jul – Nov). Burning is a good initial step in controlling gorse. A burn from August to November is the optimum time to reduce biomass and from January to April to increase seed germination. Another control method is required in conjunction with a burn for control of gorse. Tree Planting (all year). In certain areas, the establishment of trees forming a canopy will give long term control of gorse. Spot Spraying (all year). For herbicide application refer to Gorse Declared Weed Leaflet. Basal/Cut Stump (Aug – Mar). Bio-control (Apr – Jun). A seed weevil (Exapion ulicis) was first released in Tasmania in 1939. Unfortunately the weevil only had an impact on the seeding of the spring seeds thus seed still survives from the autumn flowering. Hygiene (all year). Gorse can be easily spread by machinery especially along roadsides. Care must be taken to ensure good hygenic practices in gorse infested areas. Some steps – any road grading equipment should work from clean areas into infested areas and then be cleaned on the infested area. All quarries and gravel dumps should be kept free of any environmental weeds.